Day: 50,00 € + Vat. 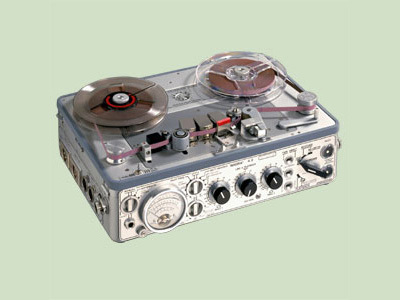 The NAGRA 4.2 is a portable mono full track 6.35-mm (¼ inch) analogue audio tape recorder designed for radio, cinema and television applications. This recorder has three speeds: 38, 19 and 9.5 cm/s (15, 7 ½, 3 ¾ ips), NAB or CCIR standard. Two mic. inputs, switchable to dynamic, T or P (48V) condenser. One voltage or current line input. One direct mixer input, 4.4V or 1.55V balanced line output, depending on the transformer installed. The NAGRA 4.2 contains separate recording and playback heads for confidence playback, built-in monitoring speaker switchable to source or tape, a reference generator, modulometer, alarm indicator for power supply and tape transport. It also has high-pass filters for recording or playback and a switchable automatic level control and limiter.